The North Central Division Police Explorers will be hosting and Open House on Monday, October 16th at 6:00 p.m., at 6969 McCallum Blvd, Dallas, TX. Information will be provided regarding how to get your youth signed up to participate in our North Central Division Police Explorers program. The Dallas Police Department has several posts across the city to cover all the seven patrol divisions. The DPD Police Explorers program is for youth ages 14-21. Check out the provided link for more information about our Police Explorers Program. 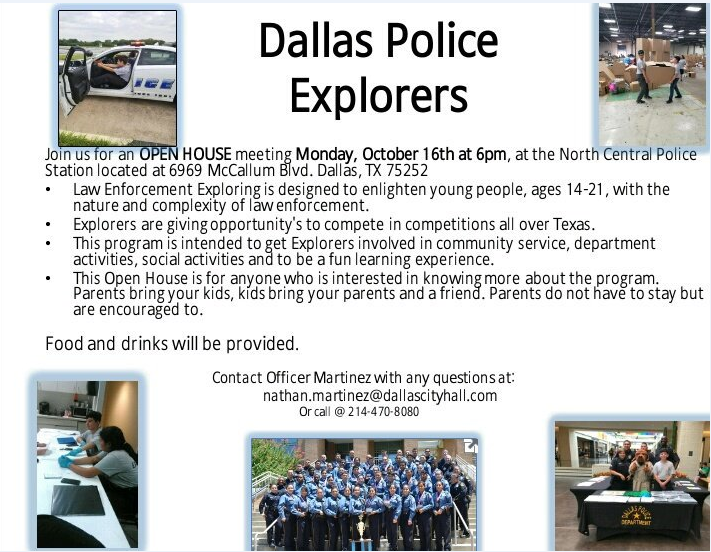 Email or call our North Central Division Police Explorer Advisor for additional questions: Nathan.martinez@dallascityhall.com or by phone at 214-470-8080.